Oil on board. 30" x 25"
Walter Parson Shaw Griffin, American (1861-1935). ​​​​Born in Portland, Maine the son of a successful woodcarver, Walter began studying art under his father. At the age of seventeen, Walter left home to attend the recently established School of the Museum of Fine Arts, Boston, where he won a scholarship. Two of his fellow students included Edmund Tarbell, and Frank W. Benson. Walter excelled as a draftsman, and by 1882, Griffin had reached a certain technical plateau. He decided to move on to study at the National Academy of Design. After only one year, Griffin received a medal for the best figure drawing. He decided to continue his training in Paris, at the Academie Julian. Travelling out to paint in the French countryside, he was inspired by the Barbizon School style but he also discovered the vibrant techniques of impressionism. During travels throughout France, Griffin filled numerous sketchbooks then sailed home in 1897 to take the position of director of the School of the Society of Art in Hartford, CT. Concurrently, he was appointed director of the Hartford Museum and Art School. 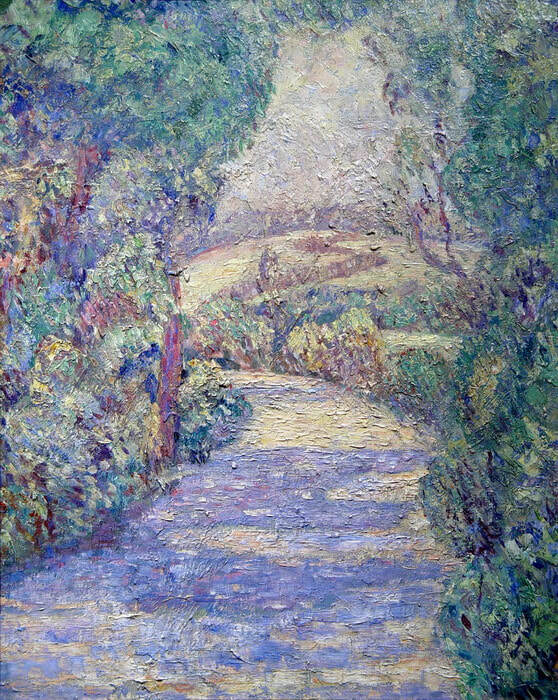 The beginning of Griffin's impressionist period coincides with his discovery of Old Lyme, CT and in 1905 he became a resident member of the artists' colony. Childe Hassam became one of Griffin's closest friends. In 1913 Griffin went to Venice. At that time, he established a new secure technique, a brilliance of color vibration, and a sureness of handling. After years of experimentation and development, Griffin had achieved a definitive, unique style. 1915 was an eventful year for Griffin. Besides exhibiting at the National Academy, he was given a one-man show at the Portland Museum, and he won a Medal of Honor at the Panama-Pacific International Exposition in San Francisco, where eight of his paintings were on view. At age 61, Griffin was elected to full membership in the National Academy of Design. Griffin died at the age of 74. His close friend, Childe Hassam died three months later. A memorial exhibition of both artists' works was later presented at the Metropolitan Museum of Art in New York City.